(Murray Lowry), had no idea it would turn so nasty. The original incarnation of Uncle Jacob was a respresentation of the real world dangers that lurk around every corner when Joe is wandering free. One small example of what awaited him out there in the cruel world. With the enhanced subplot involving a missing glove, and the freedom to explore what lurked inside Joe's mind, it seemed like the perfect opportunity to bump up the threat and significance of that character Now, he not only threatens Joe physically as his abusive adopting uncle, but he is also the embodiment of what haunts Joe’s conscience - the glove. The idea of morphing this character in that direction presented an exciting challenge. Let me start by saying that I am by no means a special effects wizard and there are no doubt better ways to do this, but this was my 'learn-what-you-need-to-do-it" technique. Most of the work was done in Adobe After Effects where I simply treated the process as moving photoshop; a program with which I'm quite comfortable. Creating a clean animated glove hand that matched the film. This meant green-screen. Although I didn’t exactly adhere to traditional standards, ( I used a black glove and a beige blanket), the outcome was sufficient. Not excellent, but very workable. Part of the trick was alligning the hand performance to the on screen actor movements. This feat required some serious puppetry work if it was also going to fit the actor's performance. After all the hand plates were completed then came the job of attaching them seamlessly to the actor’s head movements. It was at this point I realized that part of the actor’s head had to be removed because the gloved hand is much narrower. So, portions of his head were masked out and replaced with blank background plates created from stills taken from the existing scene. These plates were also set to follow with the camera movements. 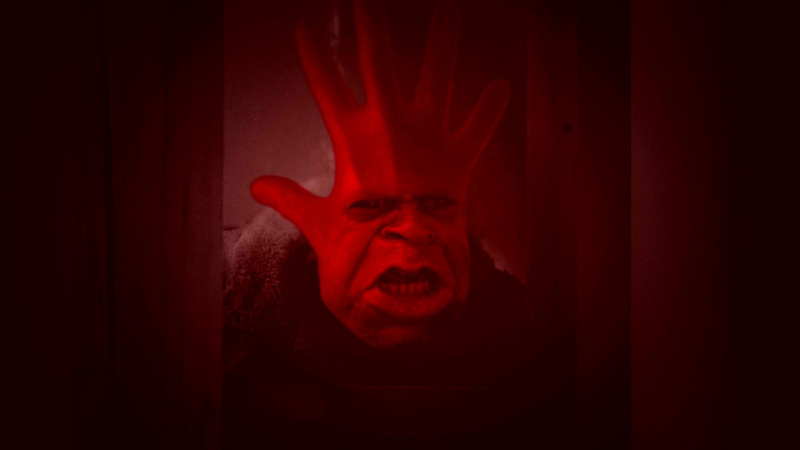 The glove was then fitted into position and motion-tracking keyframes to match the exact head movement on each frame were used to lock the glove to the film. Colour (both for the film and the glove), blurring (to replicate on screen movement), feathering, (the connection of glove to face) and masking to remove any unwanted fragments, were all employed to blend the scene together. Besides some cloning and a little painting here and there, the final touch was a darkening vignette and picture contrast. I would call this the smoke and mirrors portion of the effect. If I had another year to work on it or an effects team doing this shot I think I would have needed less camouflage in the end. Despite it's rough edges, it remains one of my favourite scenes simply because I know how much time went into it and how much of a challenge it was to get it right. Not to mention the end result freak factor. Maybe I just wanted someone in the film who made Joe look more attractive.